To a blower, Elev8 Premier Glass Studio is heaven on earth. Elev8 Premier Glass Studio is the glass blowing facility you’ve come to love. With their incredible selection of raw glass, the clean and inviting atmosphere, and their super friendly and knowledgeable team of glass blowing aficionados. You know them best however, for that dope piece you got ages back, that you’ve dropped time and time again; that piece that just keeps on going no matter what you put it through, and looks as amazing as when you got it all those years ago. Elev8 Premier Glass Studio is far more than a group of blowers, but more a family of hard working artists. Elev8 Glass Gallery gets the bulk of it’s glass from our Elev8 Glass Studio, a 3500 square foot borosilicate glass blowing facility located across the city at 6331 East Platte Ave. Making the glass here in Colorado Springs ensures our stock is well-maintained with high quality products. This creates many opportunities for us to enhance your shopping experience. Because we have our own professional lampworkers we are able to make custom glass, repair your favorite piece, and conceive new styles of water filters, pipes, and other glass, and be a heavyweight to the glass community! Our Elev8 Glass Studio is top of the line. Built with the best equipment on the market, our facility has everything from the amazing GTT torches, to a industrial level exhaust system, 3 lathes, a sandblaster and lots of kilns and 2 crucibles kilns that allow us to pull our own colors! Additionally we have a wet room, power tools for working and misters, swamp coolers and infrared heating to keep you comfortable in the harsher environments. We have everything you could ever need to blow the headiest piece anyone has ever seen, all that is required from you is your imagination. We love glass so we have this page to show what we love to do! 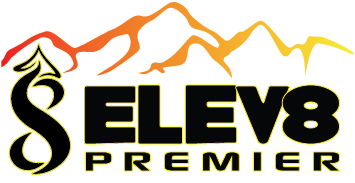 Thank you all for stopping by and checking out Elev8 Premier!